Deep after dinner discussion last night regarding the state of the world, the conflicts and of course Afghanistan came up. It's interesting to me how many people don't know the amazing history of Afghanistan and all of their conflicts because of their valuable real estate...and we are not talking about oil and mineral rights. We are talking of proximity to other countries. Some of the Marines I spoke with didn't know about the British conflict. One of them had found an Antique British rifle in an Afghani's home. He was perplexed at how it got there. The man of the house told him it was the only thing he had of his grandfather's. The Marine still didn't get it. I told him the Afghans hated the British because of how they split their country and divided the Pastun's, The designation left most of them in Pakistan. The Afghans told the British to leave. When they did pull out the Afghans killed every soldier in the columns except for one...so he could tell the British not to return. He was shocked as he was one of the Marines training the Afghan Army. How can we make progress if we don't know our history? I read this article in the NYTimes with interest. Where I was no one was texting or using their cells. The only communication we had with others was through the Military Internet Sevice through Germany or the 800 line for phone calls in the MWR and if something went down that day that under no uncertain circumstances shouldn't be written or talked about we had "River City" where the Camp was dark. I know that I also turned off my geo-tracking on my cell just in case when I took photos. I can't believe I'm having a little technical snafu regarding my trip back. The timing is a little off to visit the 2/3 as they are having a blackout the time I want to visit. But hopefully I can pull it off. Going to Afghanistan has really opened up a new world for me. I've always bought Soldiers/Marines etc. coffee, dinner or what ever when I run into them in the airport and I always try to thank them. Most of the ones I meet are very quiet. I don't ask if they are coming or going, but they all seem to have the weight of the world on their shoulders. I like having their presence around though, because it gives my life a little perspective. If I get up in the morning and am alive it's a great day. It means I have another entire day to try and do something that is meaningful. If we could all be so focused in this world on a daily basis we could all accomplish so much. So if you're reading this, no matter where you are, go out and make a difference today. It doesn't have to be huge. Pick up the litter you see when you're walking down the street. Help an elderly neighbor by offering to take them somewhere, teach a child how to jump double dutch jump rope or go online and donate somehting, even a dollar to a charity you think deserving. Remember, our troops and Veterans make a difference in our lives everyday. While waiting in line to get a new flight because my flight was canceled I was standing in front of a man that had a softened 'jar head' hair cut. I had to ask if he was a Marine...sure enough he had served in Desert Storm. We got to talking and later shared a beer and he told me a little about himself and why he joined the Marines. He told me it was because he had traveled and loved his country. He said at times he actually cries when the Star Spangled Banner is sung. He told me an interesting fact about why Marines wear a dog tag in their boot. I knew it was because if they became dismembered there was still a chance of identification. But he told me something I didn't know that boots are laced left to right. Left to right and you're all right, right to left and you're dead. Apparently it's a way to identify friendlies when you're hidden in camouflage on your belly staring at combat boots. Airports have become a special place for me, there's always someone to meet. Happy Valentines Day to all my friends serving in the Armed Forces and Veteran's. I wish I could send you all a personal Valentine...but that would require an amazing amount of planning, especially considering it takes at least 3 weeks to get mail. I'm wondering if the package I sent to the 2/3 Marine Division I was with ever got their package...it is a little scary about the mail service. 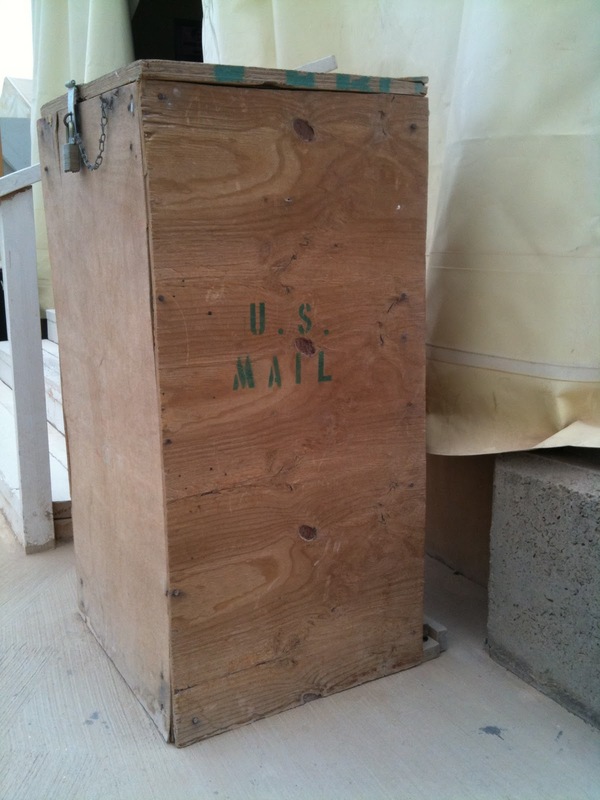 Every time I got on a helicopter or in a C130 there was at least one pallet of mail. They do their best getting it distributed, but there is so much of it that sometimes it just sits in the warehouse at the main base closest to where it's going for months. It's frustrating to watch. Thank goodness for email. Although, I interviewed quite a few Marines who liked receiving actual letters...and don't you! The mail box at Camp Geronimo.